www.cbf.org > Blogs > Save the Bay Blog > 2017 > June > Greening Diplomacy in the Bay and Beyond! Healthy underwater grasses and clear water off Poplar Island in the Chesapeake Bay. In Boy Scouts, one of the merit badges required to earn Eagle is the swimming merit badge. You'd think for somebody who earned it (and learned survival floating), being on a boat would be second nature. Not quite for me—I still prefer terra firma. Yet I found myself on a small fishing boat one summer out on the Chesapeake Bay—for a fishing merit badge, of course. Typical overachiever, right? With one eye to the seaworthiness of our "vessel," I took in the beauty the Bay. Vivid blue water as far as one can see in any direction . . . a cool breeze tempering the hot sun. And yes, some of us did catch some fish. I think I caught a flounder—anything for a merit badge. 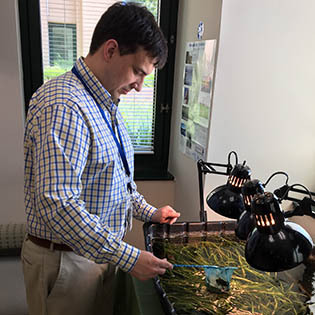 Joshua S. Wilberger, Program Specialist at the U.S. Department of State's Office of Foreign Missions, tends to his underwater grasses he is growing as part of CBF's Grasses for the Masses Program and the U.S. Department of State's Greening Diplomacy Initiative. Who would have guessed those memories would come back when I recently took a new position with the State Department? Just under a month after I joined, my supervisor invited me to attend an information session sponsored by the Chesapeake Bay Foundation. We learned about its Grasses for the Masses program, a public effort to encourage individuals to grow their own underwater grasses to be planted in the Bay. I heard through the years about the lamentable State of the Bay, how its health is impacted by human activity. The extent of the decline shocked me. As Scouts we are taught to leave sites better than we found them as a part of the "Leave No Trace" doctrine. The poor health of the Bay potentially meant future Scouts, ones just like me, may not be able to have some of the great memories that I did out on the Bay. Whether it was for the fishing, boating, or watersports badges, none of these future Eagle Scouts would have the same privilege to enjoy this natural resource. I knew I had to change that. I knew I had to be a part of this project. 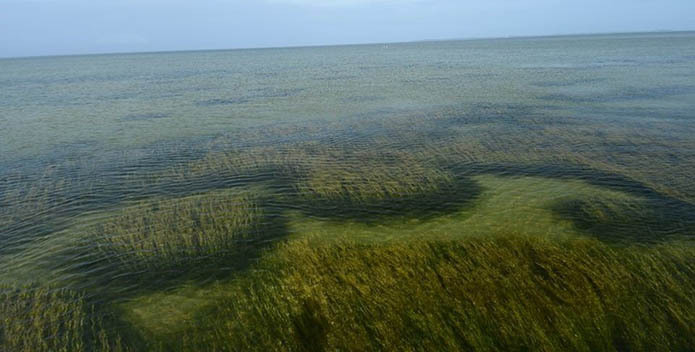 Underwater grasses do wonders for the health of the Bay and its rivers and streams. 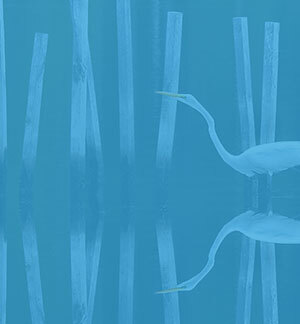 They filter pollution, provide food for waterfowl, and make up some of the most critical habitat for important Bay species like blue crabs and rockfish. I admit when my colleagues and I began preparing the grass growing kits, not one of us knew how this would turn out. But once we got the pans into the water, we all developed a strong "maternal" streak for "our" grasses. Throughout the day we'd each check the bin eagerly to see if our "babies" had grown. I can tell you there was quite a commotion when we did see our first sprout, only a few weeks after we first planted. 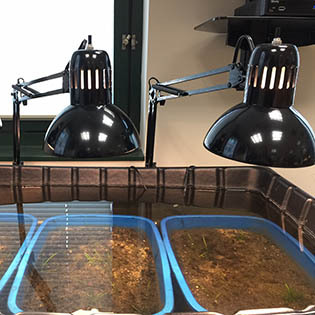 Participants in the Grasses for the Masses program grow underwater grasses under lamps from January to May before planting them in the Bay's rivers and streams in early summer. This project is a bonding experience for me and my colleagues. We work as a team to ensure there's enough water, the temperature is right, and the pump works. But we're also a part of a bigger team because embassies here in Washington are participating, too! Just as we engage in diplomacy to find solutions to joint issues, so we are working together to save a precious natural resource, and in turn, work to save our planet. It's anybody's guess how our grasses will turn out. We started in January and will transfer our plants into the Potomac River in Mason Neck State Park next week. If the pictures above are any indication we ought to do well! The project described above is part of the U.S. Department of State's Greening Diplomacy Initiative (GDI). Representatives from 15 foreign missions (the embassies of China, Costa Rica, Finland, Germany, Indonesia, Iraq, Malta, Pakistan, Portugal, Slovenia, Spain, Switzerland, and United Arab Emirates as well as the European Union and the World Bank), joined the Office of Foreign Missions (OFM), and the Bureau of Oceans and Environmental and Scientific Affairs (OES) to grow and plant underwater seagrass in the Potomac River, a tributary of the Chesapeake Bay, in support of the Chesapeake Bay Foundation's Grasses for the Masses program.